Aaahhhhh. The ever classic grilled cheese. I whip up a quick sandwich at least twice a week for lunch. And I’ll often pair mine with a creamy tomato soup spiced with a few shakes of Italian seasoning. Classic American fare for sure. But there can be more than buttered bread with cheddar in between. 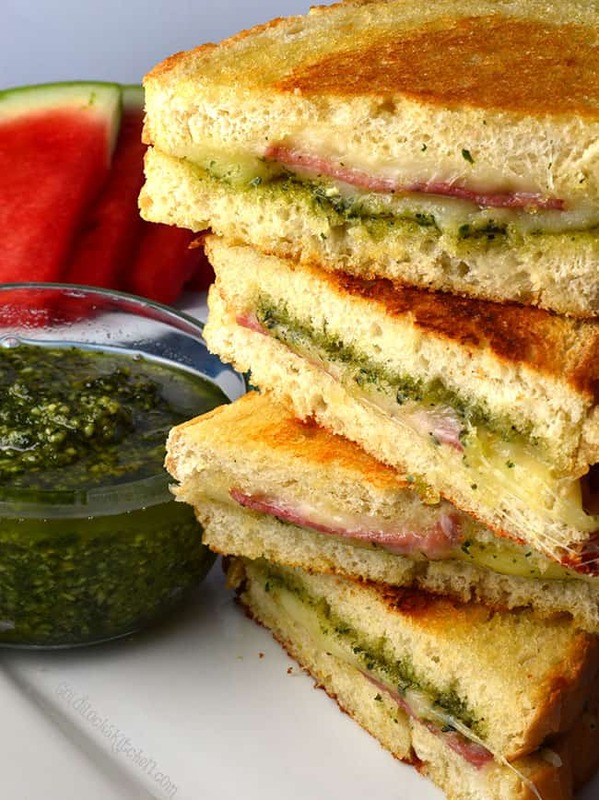 Oh yes, much much more…like Salami Grilled Cheese with Basil Pesto! Wham bam, the classic grilled cheese has gone gourmet! These sandwiches are absolutely delicious, and impressive too! 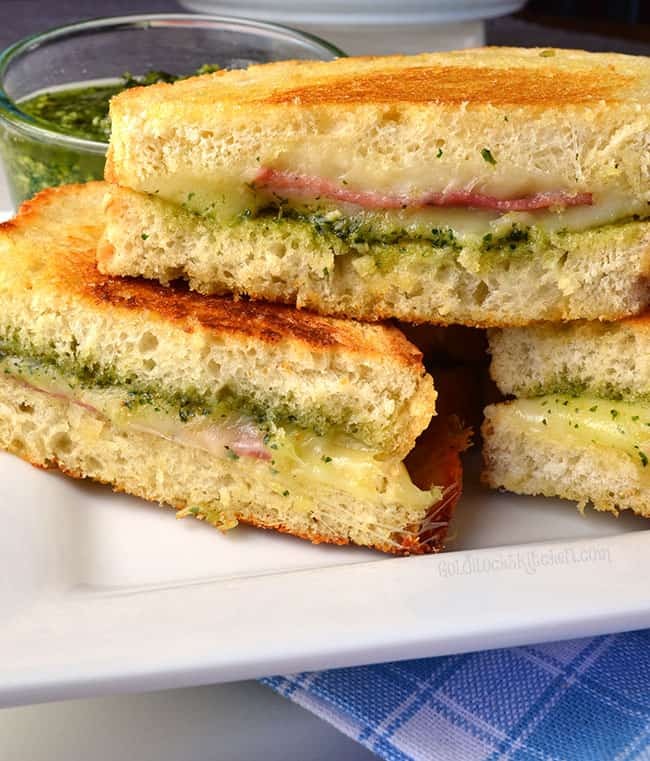 The combination of Provolone and Monterrey Jack cheeses are a perfect match with Basil Pesto. They melt down to perfect gooiness that leave strings off every bite. I like to use a nice bakery loaf of bread here, usually some kind of Italian hearty bread, or french bread would do just fine too! Pesto is a simple combination of fresh basil leaves, pine nuts, Parmesan, garlic and olive oil processed together. It’s fabulous on just about anything. I highly recommend making your own fresh pesto at home for the best flavor. If you’re looking for a recipe, try mine! But you should be able to find a jar of pesto on the shelf at your local grocery store in a pinch. 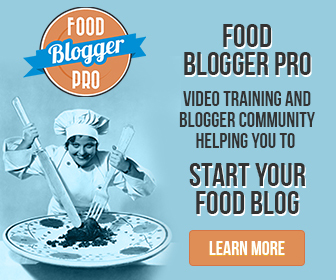 If you have a Panini press, great! Use that instead of a frying pan. Just be careful not to overload your sandwich with too much cheese. You can have so much fun with this recipe, especially when you start experimenting with different types of meats in your grilled cheese. I have even used spam. Yes I will admit it~ even spam. I did fry it up first though :0) Please try this recipe and let me know what you think! I hope you feel it’s worth every bite. 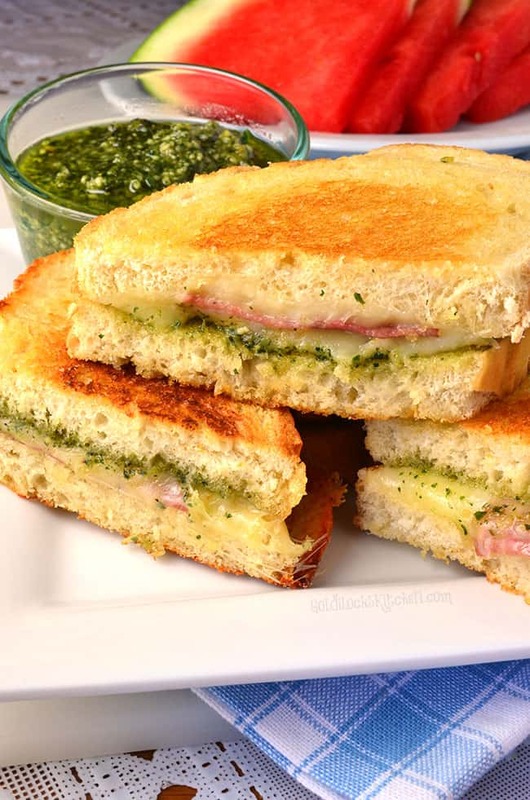 the classic grilled cheese has gone gourmet with melty Provolone and Monterrey Jack cheese livened up with the great taste of basil pesto. Heat a large frying pan over medium heat. Toss the cheeses together in a mixing bowl. Place four slices of bread on a cutting board or plate. Lightly butter each slice. Flip two of them over and spread the other side lightly with pesto. Sprinkle a very generous pinch of cheese mixture over the pesto, then place two or three slices of salami over the cheese. Sprinkle more cheese over the meat, then place the empty slice of bread on top. Gently place sandwiches in frying pan. Cook until golden brown, about two or three minutes per side, carefully flipping over with a spatula. Repeat with the remaining bread and filling. Slice in half and serve immediately.